We’ve decided to start a new series of podcasts focussing on our feature content. Every couple of weeks we’ll talk with WIRED writers about the stories they’re reporting on. I’ve kicked off the series with a conversation with Michael Hodges, who wrote our April cover story ‘Hacking North Korea’. 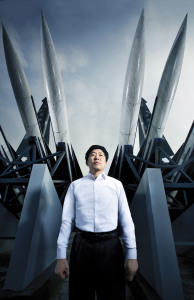 Michael travelled to South Korea to meet defectors like Park Sang-hak (above), who leads a group called Fighters for a Free North Korea and survived an assassination attempt in 2011. Kim Jong-un’s regime has named him ‘Enemy Zero’. Michael’s report focuses on how the internet is making information more widely available in the Democratic People’s Republic of Korea and reveals that, while the country remains a closed society, activists in the South are now using technology to promote political reform in Pyongyang. Here’s a link the podcast on Wired.co.uk. If you’ve not read the feature story, it’s here. A winner of the PPA British magazine Writer of the Year, Michael is a regular contributor to WIRED and the author of a social history of the AK:47, The Story of a Gun, which was a New Yorker pick of the week.